Before 31 July 2019, you can take the Blue Line with departures at 9:40am and 1:40pm daily from Taipei Main Station and participate in a free guided tour by hopping off at the Grand Hotel. Experience the mysterious journey of the longest "secret tunnel slide" in the world! Great tour! Easy to do both tours, just change at the Main station. The lady on the bus asked where you wanted to get off so no worries that you would miss your stop! A little bit unclear where the stop was, I didn’t realize at first that it was around the corner of the normal bus stop. Taipei is a city bursting with life and what better way to explore some of its most popular landmarks than a 23 stop tour that is offered along two double decker bus routes? 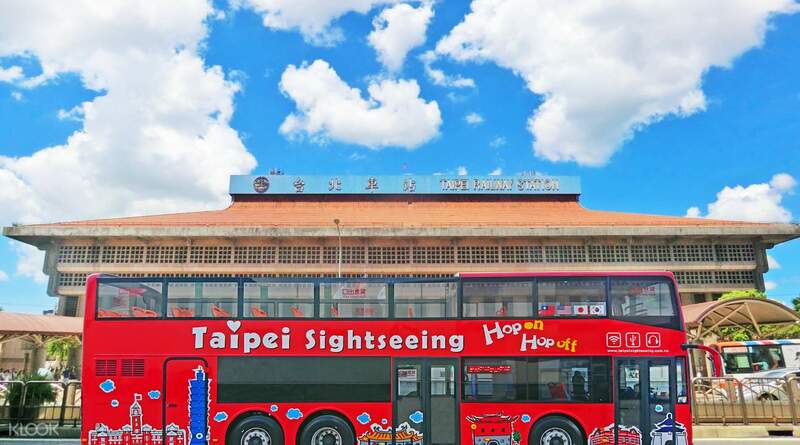 Your Taipei double decker bus tour will start off at Taipei Main Station. You will then travel to Ximen, Chiang Kai-shek Memorial Hall, and depending on which color line you take, you will discover different landmarks. Take the blue line to visit places in the north, such as the National Taiwan Museum of Fine Arts, National Palace Museum, and JianTan. On the red line, you will travel west to Taipei City Hall, Sun Yet Sen Memorial Hall, and the largest park in Taipei, Da'an Park. Choose to hop off at any stop for sightseeing, and hop back on when the next bus on the schedule arrives. You will be provided with a headset that offers introduction to Taipei in English, Chinese, Japanese and Korean. 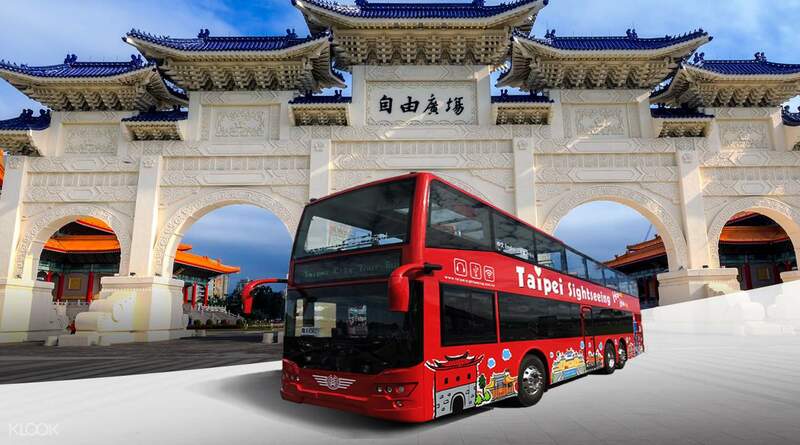 You will also have access to free Wi-Fi onboard the Taipei sightseeing bus, allowing you to capture and share moments of your journey. After a long while to find the exact pick up stop at the Taipei Main Station we were on the roll. We did the red line route first without going down then we changed bus for the blue line after taking our lunch. The double decker bus was the best way to enjoy Taipei hassle-free. Advisable to first time visitors. Happy and satisfied customers here. After a long while to find the exact pick up stop at the Taipei Main Station we were on the roll. We did the red line route first without going down then we changed bus for the blue line after taking our lunch. The double decker bus was the best way to enjoy Taipei hassle-free. Advisable to first time visitors. Happy and satisfied customers here. A good way to tour the city! We had a difficult time looking for the meeting point at Taipei Main Station. But overall, its really a good experience, plus the freebie when you booked through klook was really cute! There should be a guide explaining the places. A good way to tour the city! We had a difficult time looking for the meeting point at Taipei Main Station. But overall, its really a good experience, plus the freebie when you booked through klook was really cute! There should be a guide explaining the places. We booked this since we had some free time before leaving for the airport. We were still able to get on the red and blue route with the 4 hour pass. However, we didn't get off at any of the drop off points anymore since we were already pressed for time. We still enjoyed and opted to stay in the open portion of the bus even though it was drizzling and cold. We soaked up on the cool weather before going back home to hot and humid weather. We booked this since we had some free time before leaving for the airport. We were still able to get on the red and blue route with the 4 hour pass. However, we didn't get off at any of the drop off points anymore since we were already pressed for time. We still enjoyed and opted to stay in the open portion of the bus even though it was drizzling and cold. We soaked up on the cool weather before going back home to hot and humid weather. I enjoyed this activity so much. The tour guide was friendly. You should book this activity when your in Taiwan. 24hrs will be great because you can rise both red and blue routes and it is hassle free because if you have ticket in national palace museum you can go there by riding this hop on hop off sightseeing bus. The open top was perfect seeing the Taipei 101 at night was so beautiful. Totally recommend this one. I enjoyed this activity so much. The tour guide was friendly. You should book this activity when your in Taiwan. 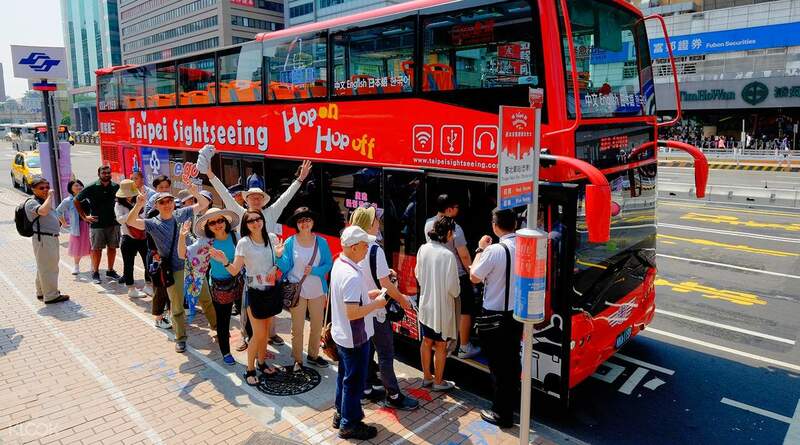 24hrs will be great because you can rise both red and blue routes and it is hassle free because if you have ticket in national palace museum you can go there by riding this hop on hop off sightseeing bus. The open top was perfect seeing the Taipei 101 at night was so beautiful. Totally recommend this one. Easy to find. The bus is on time except if its on a rush hour and theres a traffic. Very convenient and easy to use. Recommended for tourist who doesnt much have time to go around taipei but wanted to see the city. Easy to find. The bus is on time except if its on a rush hour and theres a traffic. Very convenient and easy to use. Recommended for tourist who doesnt much have time to go around taipei but wanted to see the city. We totally enjoyed our 4Hour Hop On,Hop off tour. We were able to visit ChiangKai Shek Memorial Hall, Taipei 101, Sun Yet Sen Temple and we went to Longshan Temple as our last destination. For me, its very convenient since they will drop you off on your preferred destination and you do not need to walk for a long time. We only went to red line destination but still we really enjoyed our trip. My experience with Klook was amazing! This ticket is very affordable and is indeed a value for your money. I will definitely purchase from Klook again. See u next time Taiwan! We totally enjoyed our 4Hour Hop On,Hop off tour. We were able to visit ChiangKai Shek Memorial Hall, Taipei 101, Sun Yet Sen Temple and we went to Longshan Temple as our last destination. For me, its very convenient since they will drop you off on your preferred destination and you do not need to walk for a long time. We only went to red line destination but still we really enjoyed our trip. My experience with Klook was amazing! This ticket is very affordable and is indeed a value for your money. I will definitely purchase from Klook again. See u next time Taiwan! This is a must try especially if you want to experience the culture of Taipei. We were able to try the blue and red line because you can easily hop in and off at the bus stations. Easy to locate, accessible, on time and very convenient. This is a must try especially if you want to experience the culture of Taipei. We were able to try the blue and red line because you can easily hop in and off at the bus stations. Easy to locate, accessible, on time and very convenient. Departure pick up point was quite easy to find and the bus conductor was very accommodating. She will ask where you intend to stop and remind you if you’ve reached the right stop. Surprisingly, though the city is pretty crowded due to public holidays and a surge of tourists, the buses were never packed and we always get to have a seat. There was some drizzles and we managed to get seats at the covered area of the bus too, so that was quite convenient. We took both the blue and the red line so I think the price paid was pretty worth it. Also, you can scan the QR codes at the bus stops to keep track when the buses are arriving at which stops (labelled by numbers so you don’t have to worry about the chinese characters). Departure pick up point was quite easy to find and the bus conductor was very accommodating. She will ask where you intend to stop and remind you if you’ve reached the right stop. Surprisingly, though the city is pretty crowded due to public holidays and a surge of tourists, the buses were never packed and we always get to have a seat. There was some drizzles and we managed to get seats at the covered area of the bus too, so that was quite convenient. We took both the blue and the red line so I think the price paid was pretty worth it. Also, you can scan the QR codes at the bus stops to keep track when the buses are arriving at which stops (labelled by numbers so you don’t have to worry about the chinese characters).